As the undeniable changes caused by climate change are up and about, considerations involving the weather is something everyone has to take seriously, in seeing to the successful course of celebrations and occasions, weddings included. 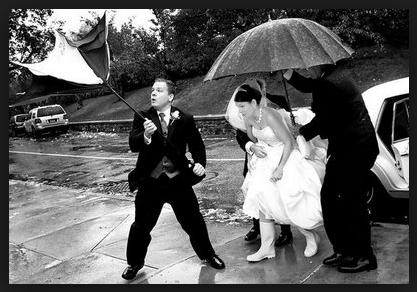 Given the fact that weddings are momentous occasions that should be celebrated with family and friends, countless weddings have been ruined because of bad weather, with a number of outdoor wedding receptions marred by stormy skies to wedding celebrations being cancelled because out of town guests couldn’t make it due to heavy snowfall. When planning for your wedding, you’re bound to focus on what could be called as “staples”, mostly involving wedding dresses and outfits, where the wedding would take place and when it would take place. Catering and the wedding reception’s entertainment are bound to be something you’ll think about too, which is essentially all good. You want your wedding to be perfect after all. But as you think about these “staples”, don’t fail to consider the weather, especially when the individuals in your guest list would be made up of out-of-towners. If you plan on having an outdoor reception, consider a back up alternative should it weather conditions not go in your favor. If you’re intent on having a beach wedding, take the time in updating yourself with weather forecasts prior to your wedding day, so as to prepare for any unexpected rain. Long story short, as you plan for your wedding, don’t forget to think about the weather.